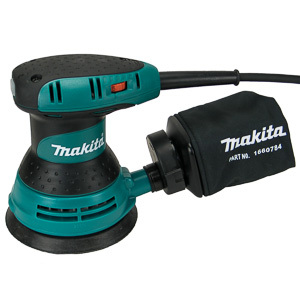 The circular saw power unit was one of the add-ons we had to get for our B&D Matrix system. A small circular saw is a great addition to any carpenter's or homeowner's toolbox. The saw offers the ability to make straight and true cuts in tight places. Besides, cordless circular saws are scary-awesome tools. Let's take a look at how well the BDCMTTS circular saw performs in the Hingmy shop. 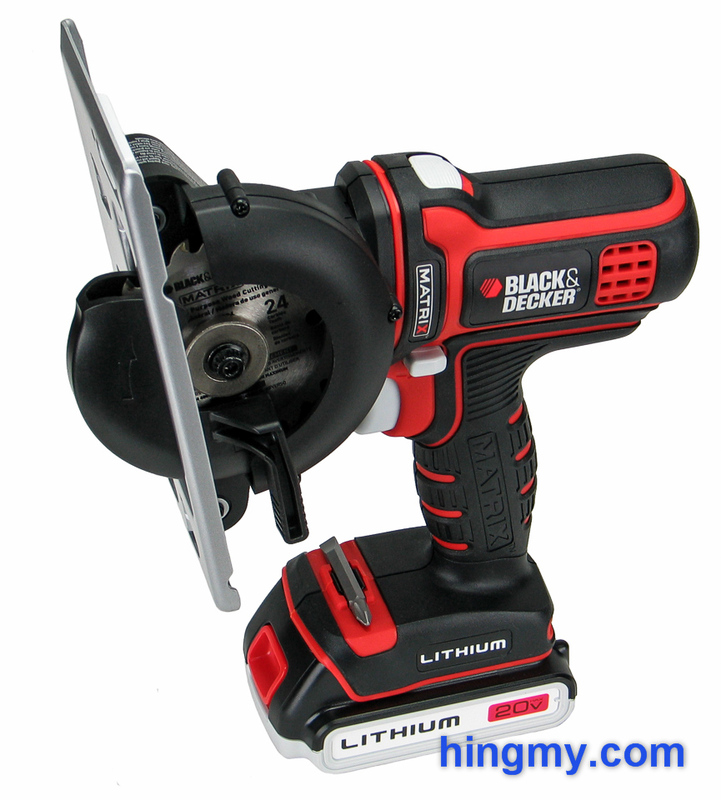 The BDCMTTS is a small circular saw power unit in B&D's Matrix line. 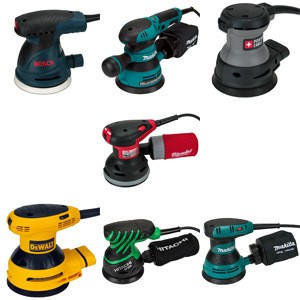 The saw unit can be installed in three different handles turning the saw from a cordless model into an AC powered one. 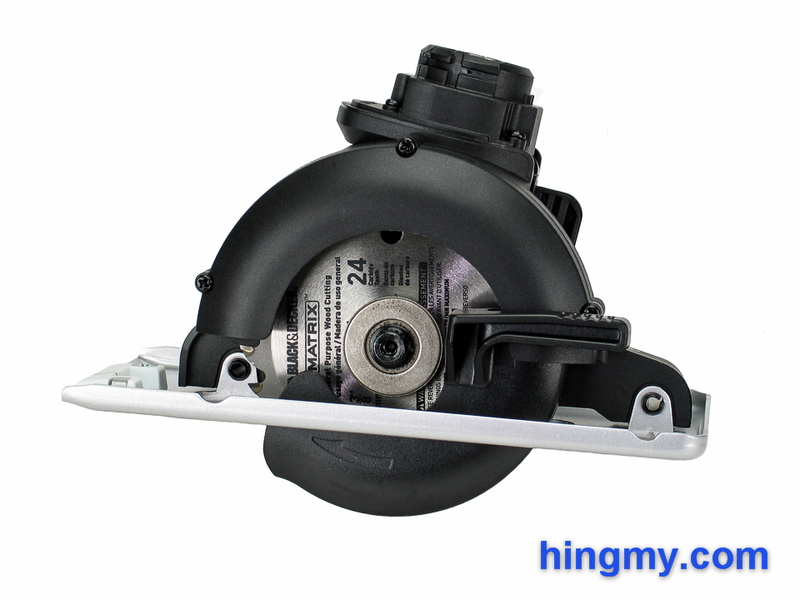 The capabilities of the saw change depending on the motor contained in the handle. We tested the saw with the 20V battery powered handle. The saw performs better with the AC handle, and slightly worse using the 12V handle. 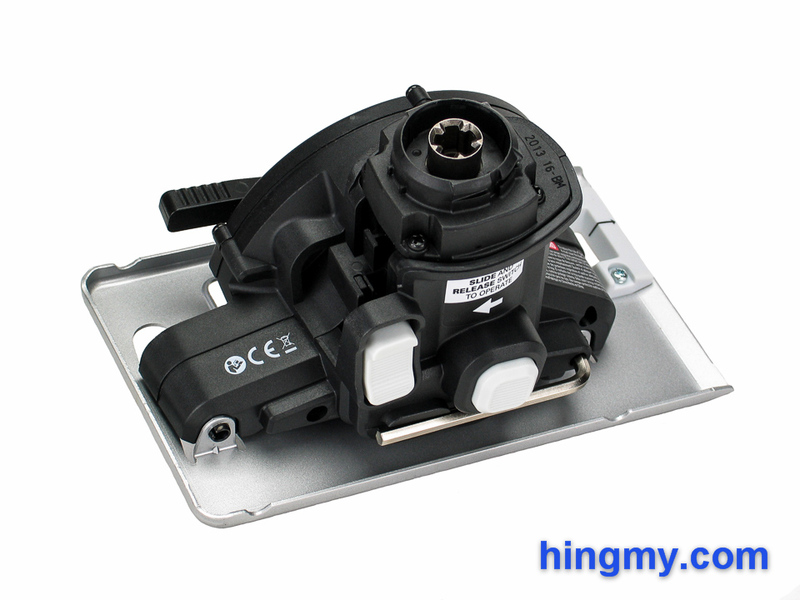 The saw's body, upper and lower blade guards, and the mounting brackets are all made from hard plastic. This is a fine choice for a saw this size. Overall build quality is good. If you don't abuse the saw, it will serve you well for many years. The lower blade guard is the weakest point of the saw. It gets caught on the material being cut every now and then. I predict it will be the first part that breaks on most saws. When examining the controls on the body it immediately becomes clear that the saw's cutting height and angle cannot be adjusted. The motor is locked in the 90 degree position. The cutting depth is fixed. While this limits the cuts that can be made with the saw, it also drastically simplifies the way the motor unit is mounted on the base plate. The BDCMTTS's motor mounts are more robust and durable than those found on full-size saws. The stamped metal base shows no sign of deflection under load. Both of the long edges of the plate can be used to guide the saw when making a straight cut. The blade and base plate come perfectly aligned from the factory. Since the saw has no tilting mechanism there is nothing to go out of square. The cutline indicator at the front of the saw is perfectly aligned with the saw blade included in the kit. Unfortunately it is not adjustable. If you install a wider blade in your saw, you have to draw a new cutline indicator. The saw unit has a separate safety trigger that must be engaged in addition to the trigger on the handle every time the saw is started up. Once the saw is running the safety trigger can be released without stopping the saw. Once engaged the saw cuts at full speed no matter the trigger position. 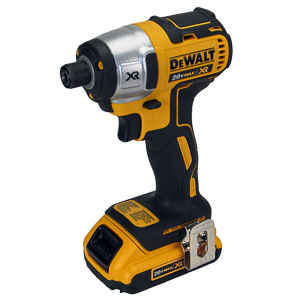 The safety switch is in an awkward position to operate with just one hand on the handle of the tool. 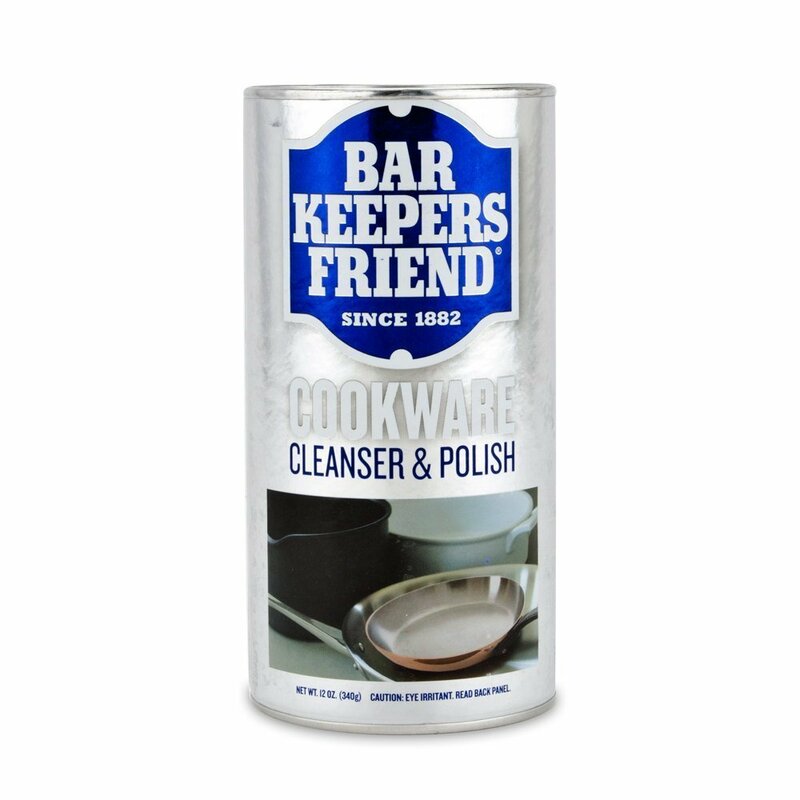 It is within reach of the index finger of the hand on the tool. After the saw is running the user has to slip his or her hand downward without letting go of the main trigger to get a proper grip on the tool. With some practice the maneuver becomes second nature, but it is an inconvenience worth mentioning in a review. Blade changes are simple and quick thanks to the integrated arbor lock. The Allen key needed to loosen the arbor bolt is stored onboard in a location where it is both out of the way, and easy to access when you need it. Thanks to the small size of the unit, holding the saw with one hand while simultaneously engaging the arbor lock is very simple to do. Even without regular practice blade changes take under a minute to complete. Cutting performance is surprisingly good in 3/4" plywood. The saw chews through the material at about 1 in/sec. That's fast enough to satisfy even impatient users on small projects. On large jobs the BDCMTTS finishes well behind the competition. Thicker materials up the saw's maximum capacity are not a problem either, as long as the saw's fed rate is adjusted downward accordingly. With enough patience the saw can complete any cut. Due to its small blade the BDCMTTS unit excels at cutting curves. While doing so the blade tends to bind, but with enough patience curves down to a radius of about 8-9 inches are possible. Plunge cuts are equally easy to complete. 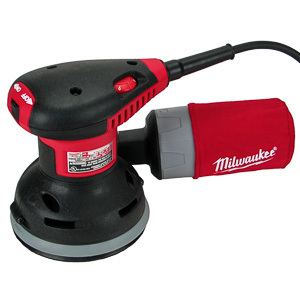 The BDCMTTS is one of the best saws for making cutouts in countertops. Thanks to its small size it can be more accurate in these situations. With a straight edge as a guide the saw can be used for panel processing. The high center of gravity and pistol grip handle require the user to pay more attention to the cut. One careless moment is enough for the blade to drift away from the fence. The small blade of the saw tends to break out of an established channel much more readily than a full-size blade. In a pinch the BDCMTTS unit is a good substitute for a full-size saw, but it will be harder to use. 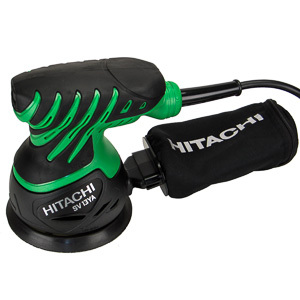 The saw inherits the 20V handle's main weakness: the abysmally slow battery recharge time. It takes the charger 5-8 hours to recharge a dead battery, a task the competition completes in 30-45 minutes. Given this information discussing endurance is a bit of a red herring. On a full charge the saw's cutting capacity is north of 100 board feet, but you better complete your job before the battery runs dry. 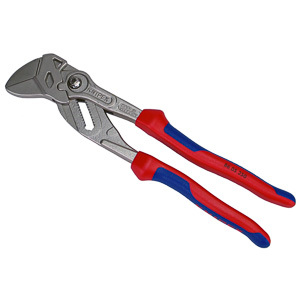 If you do not own the AC handle, the BDCMTTS is a light duty tool you should only use on small projects. The saw unit itself is well built, but was not engineered for continuous use. Don't expect it to run all day long, even when it is mounted in the AC handle. Tear-out above the cut is significant at high feed rates. The saw's blade rotates too slowly to produce good results in this test. At slow feed rates tear-out is limited to the area within 1/16" of the blade, but it is still far worse than what the best circular saws offer. If you are looking for a clean edge, the mostly tear-out free lower side of the cut is where you will find it. Dust collection is non-existent on this saw. Like most circular saws the BDCMTTS ejects most of the dust at the rear of the upper dust shroud. 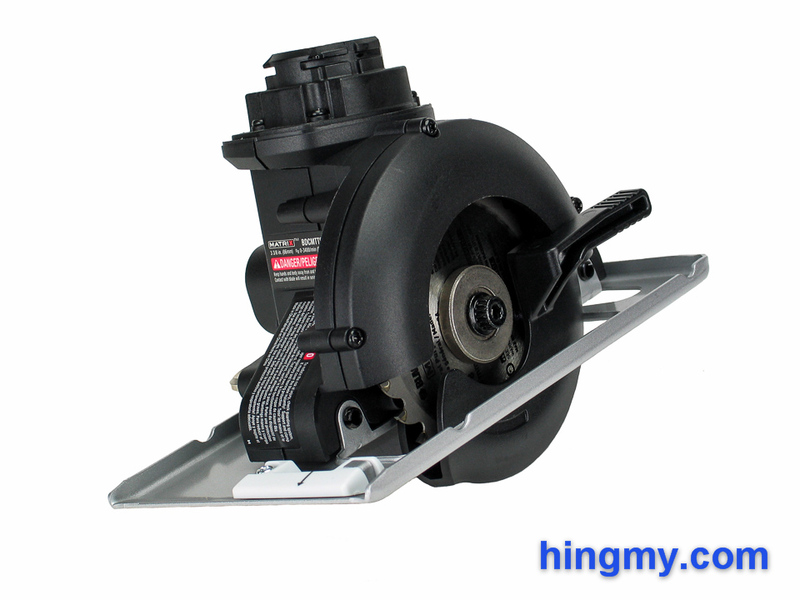 Unlike most saws this saw has no dust port to funnel the dust away from the saw's base plate. As a result a large amount of dust accumulates in the rear of the saw as you complete a long cut. The blade launches a good amount of fine dust into the air, but much less than the full-size saws do, which rotated at a much higher speed. It is impossible to operate the BDCMTTS in a dustless manner. The immediate area around the cut and the saw itself will be covered in dust no matter what you do. The B&D BDCMTTS saw unit is a capable, durable, and surprisingly nimble addition to the Matrix line. Neither able to tilt or change the depth of its cut, the saw has a limited usage range. It is powerful enough to complete any cut a full-size saw can, but it'll do it slower and with a little more jitter. When used with a guide fence the saw produces perfectly straight and true cuts. In a home shop setting the BDCMTTS can be a substitute for a full-size saw. Just about any corded saw will outperforms it by miles, however. What's left is the BDCMTTS's ability to cut curves and its agility. 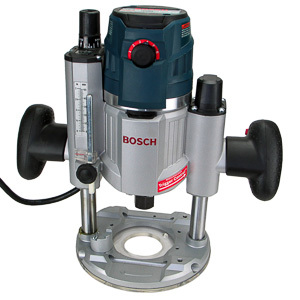 This unit is one of the best saws for making cut outs in counter tops. The long battery recharge time limits the saw's usefulness on the job site. If your project is small, the BDCMTTS can handle it. For everything else there are good, low price full-size circular saws in the market.